Giethoorn is a village in the Dutch province of Overijssel. It’s about an hour and a half drive from Amsterdam, and is known for being very pretty as it contains very few roads and much of the village can only be reached by foot or boat. There are many canals and bridges (more than 180 bridges) which only adds to its picturesque charm. 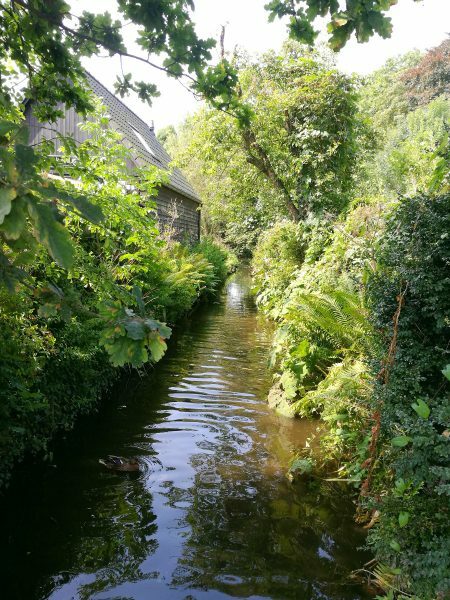 Most of the houses and cottages have thatched roofs so it feels a little as if you have stepped back in time as you walk along the footpath by the canal admiring the pretty homes and perhaps stopping for lunch at one of the canal-side cafes or restaurants. 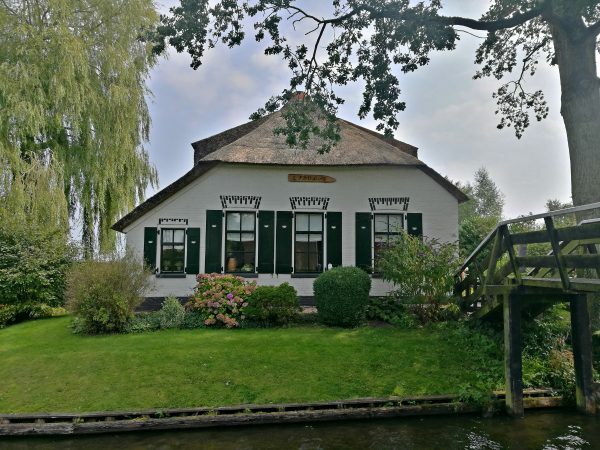 One fun fact that locals are apparently very proud of, is that Giethoorn beat out around 182 contenders across the world to become a destination on the 80th anniversary international edition of Monopoly (in 2015)! You can also find out a little more about just how they managed this here. As I noted, it will take about an hour and half by car to get to Giethoorn from Amsterdam. 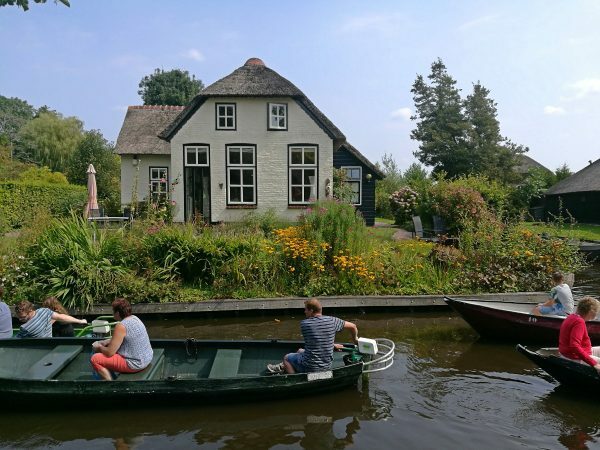 Either driving yourself or going with a tour-bus is probably the easiest way to get to Giethoorn, as it’s not as easy to get to by public transport. It is possible though, if you catch a train from Amsterdam to Steenwijk (probably with a train change halfway) and then a bus from Steenwijk into Giethoorn. The whole trip will take you around 2 hours. I would only recommend doing this if you are thinking of staying overnight (or longer) in Giethoorn as it’s a lot of time and effort (and money!) 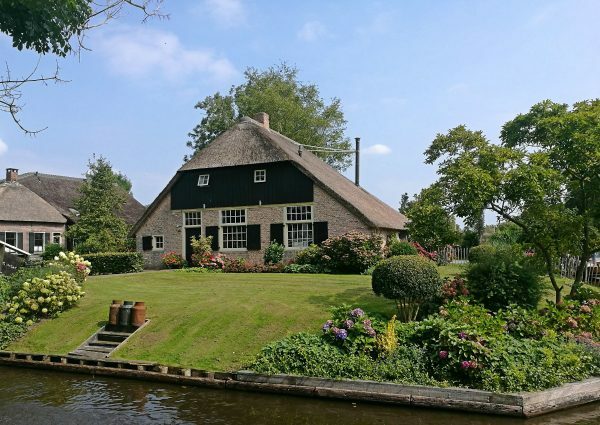 for just a day-trip, but it’s possible if you really want to see Giethoorn and only have a day. I would recommend hiring a car if you don’t own one and maybe combining your visit to Giethoorn with a trip to De Orchideeën Hoeve as well. The two destinations combined make a lovely day-trip from Amsterdam or Lelystad! 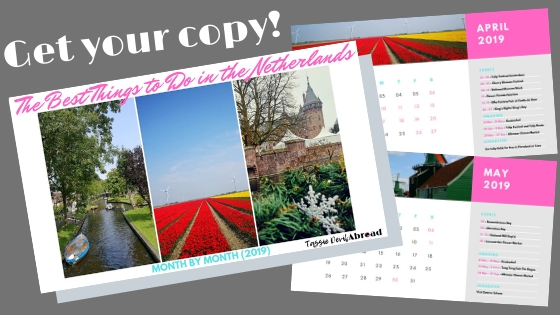 You can read more about De Orchideeën Hoeve in my post here, and if you are thinking about perhaps staying in Lelystad (much closer to the two places) I’ve also written a whole guide on fun and free things to do in my current hometown here! 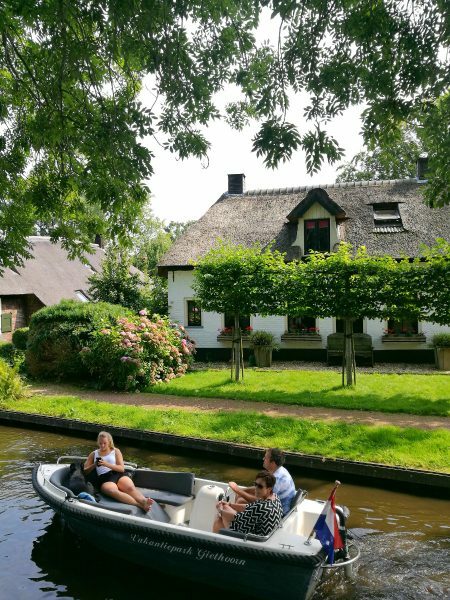 Now that you know the nitty gritty details about Giethoorn and how to get here, I’m going to let you in on a few little secrets that I discovered when visiting this well-known destination for myself! 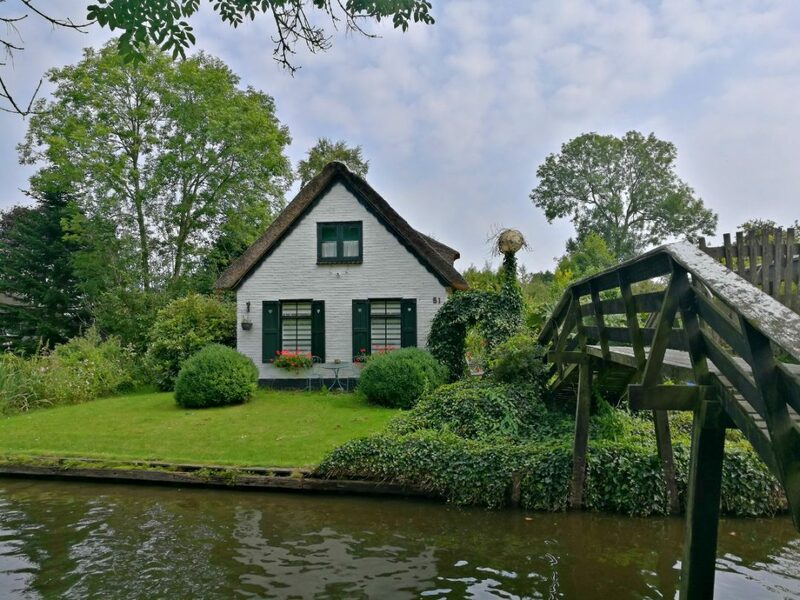 Just think of me as your travel Mythbuster as I sort the facts from fiction so you can make an informed decision for yourself before you go to Giethoorn. 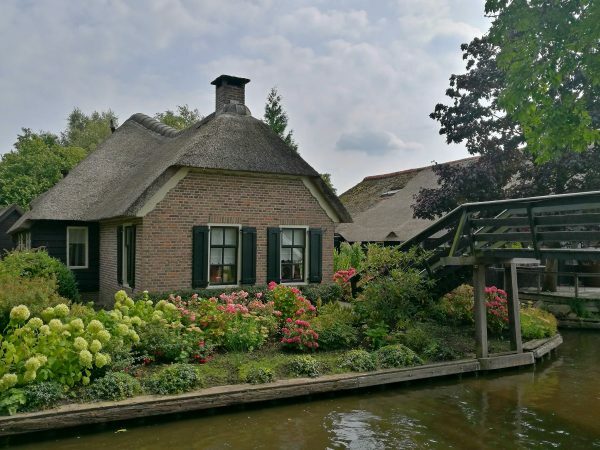 Fact or Fiction: Giethoorn is a town with no roads? Well, yes and no. 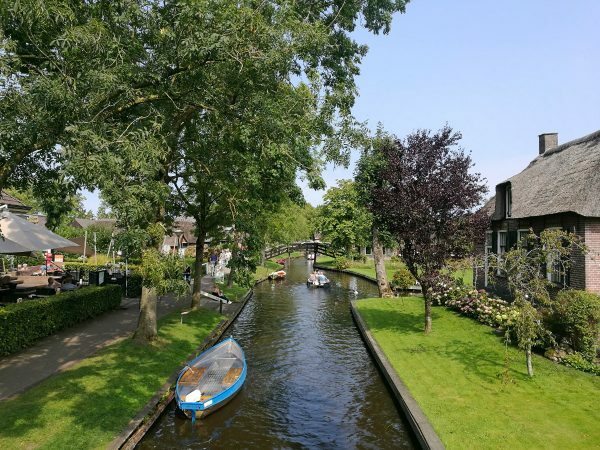 Technically, no; the village of Giethoorn does have roads and even car-parks, but there is a large section in the middle that is only accessible by footpath or canal. 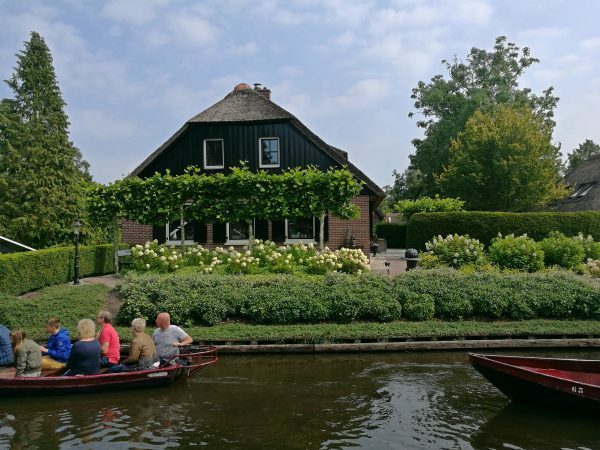 Most likely, if you’ve seen a photo of Giethoorn, it’s been taken along one main walking strip where there are a lot of canal-side cafes, shops and restaurants; as well as places you can hire whisper boats to explore the canals. 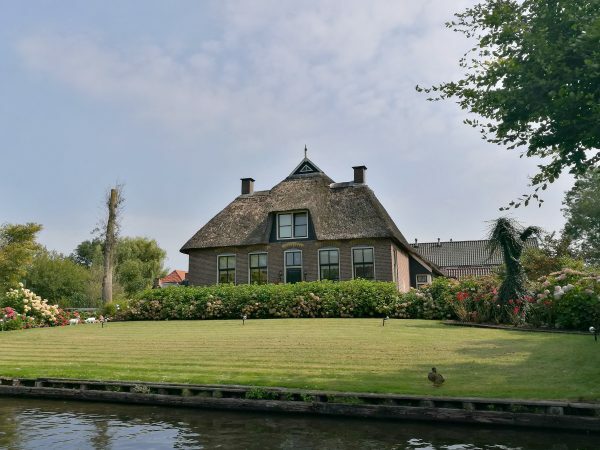 Some of Giethoorn’s residents would definitely only be able to access their house by canal, which must make grocery shopping and moving house interesting events! 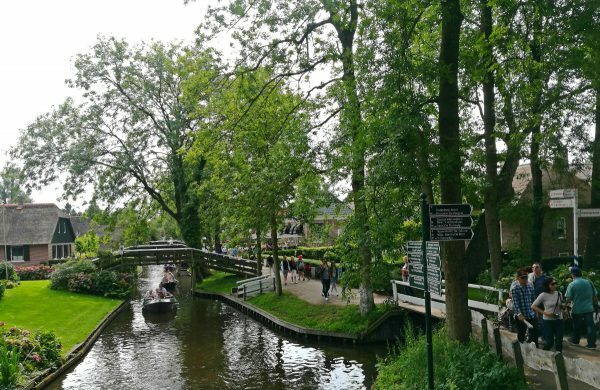 But there are roads, so you can arrive by car and even park for free and then walk alongside the canals to see all the famous and most picturesque spots without renting a boat. 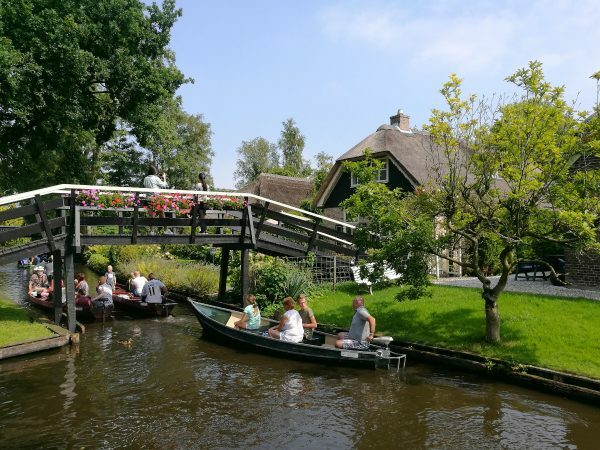 Fact or Fiction: Giethoorn is an idyllic, untouched destination? 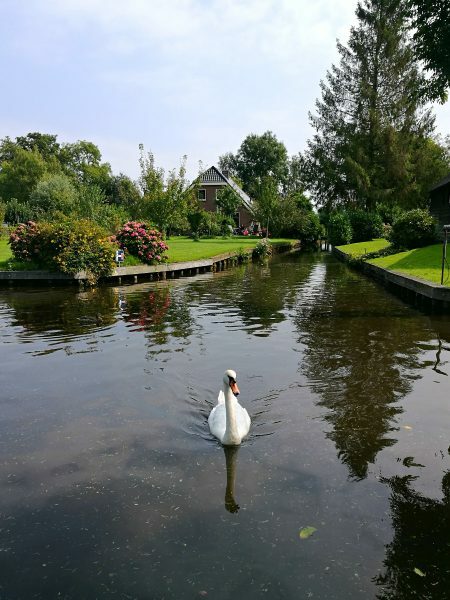 Fact or fiction: Giethoorn is a beautiful destination? I would have to say, YES! I mean, yeah there’s a lot of other tourists, but they don’t change the fact that the town itself IS actually very pretty; it wouldn’t be so popular if it wasn’t. There are boxes of flowers on a lot of the bridges, the houses are all immaculately cared for with beautiful painted shutters and gorgeous gardens. It’s also very nice to sit beside the canals and watch the boats and ducks and swans go by, whether you sit on the ground or a bench with a picnic, or in one of the canal-side restaurants. 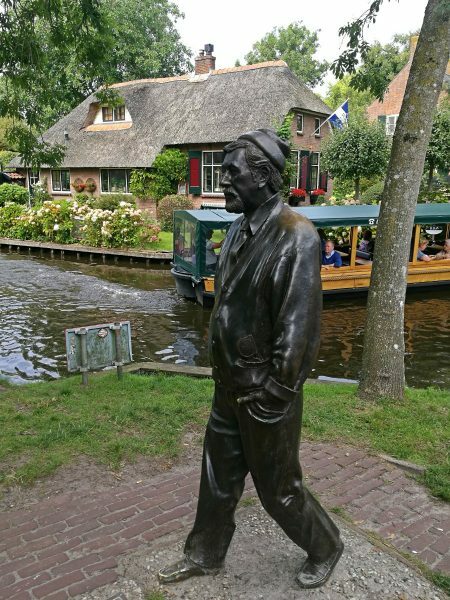 Personally I am not sure I would bother visiting Giethoorn for more than a day, or possibly an overnight trip. Apart from walking along and taking photos, boating along and taking photos, or stopping to eat somewhere; it’s not a place with a lot to actually do. 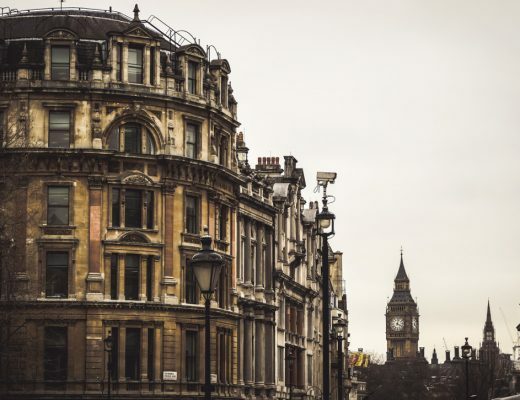 There are one or two souvenir shops and two museums, but perhaps that feeling of idle relaxation is what you are looking for on your next vacation. 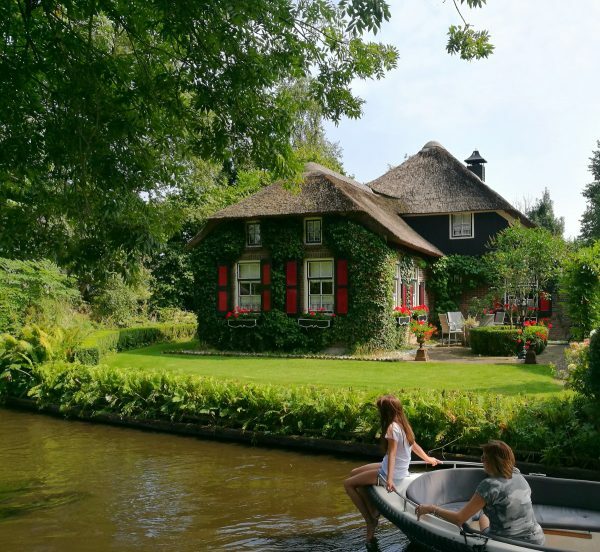 At least now you know the real details about visiting Giethoorn and can decide for yourself how (or if) to do it. 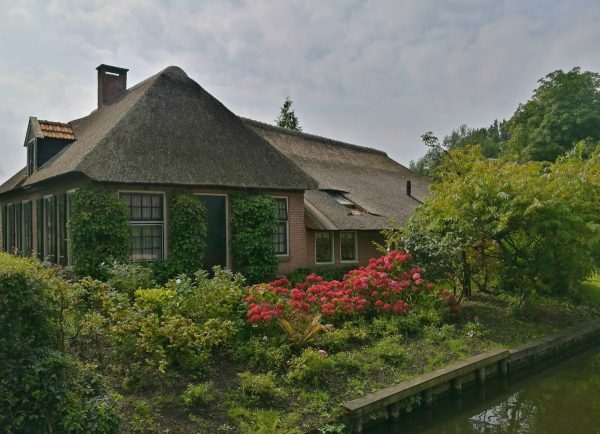 Before I sign off, I’ll leave you with some more of my favourite pretty photos of the houses you can see in Giethoorn. Want to know the best time of year to visit the Netherlands and what events are on at that time? 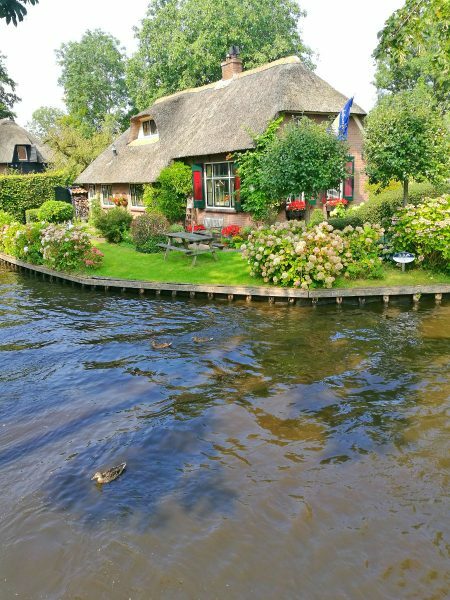 Have you ever dreamed of exploring Giethoorn, or have you been? Let me know in the comments what you think about this famous Dutch town! And don’t forget to pin one of these for later if you are planning to ever visit Giethoorn for yourself. great post! 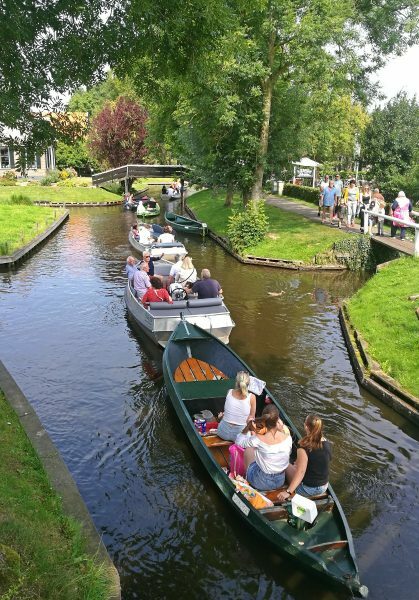 I had no idea Giethoorn was so popular! I went about 4 years ago with my boyfriend but it was not too busy then (it was the end of September though to be fair). Love the part about them being so proud of being in monopoly! Oh my gosh I’m now in love with this little town!! It looks like something out of a story book – everything seems so picture perfect :O Hope to be one of those many tourists soon! Haha, yes it is gorgeous even with the tourists; which of course, I was as well! Love all the pictures of what the place actually looks like with all the boats. Still a beautiful place but good to know what you’re getting into! Thanks for the honest post. I too have seen images and thought it looked like such an idyllic spot to visit. Now if I decide to visit, I’ll know what to expect! It can be idyllic in certain spots, and probably at certain times, but it’s good to know what most of it will be like! Sounds like a very relaxing daytrip to have from Amsterdam. 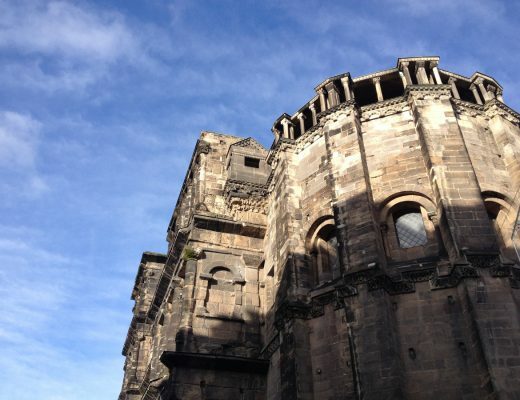 I had never of this town so its good to see what options from Amsterdam there are to explore. Hmm, I don’t think it’s a waste. I mean there’s so much to do in the Netherlands besides Amsterdam but if you only have four days I would say spend at least two enjoying Amsterdam proper and maybe you could do a half day to Zaanse Schans (it’s only 15 minutes by train) and then a day trip to Giethoorn if you really want to go there. 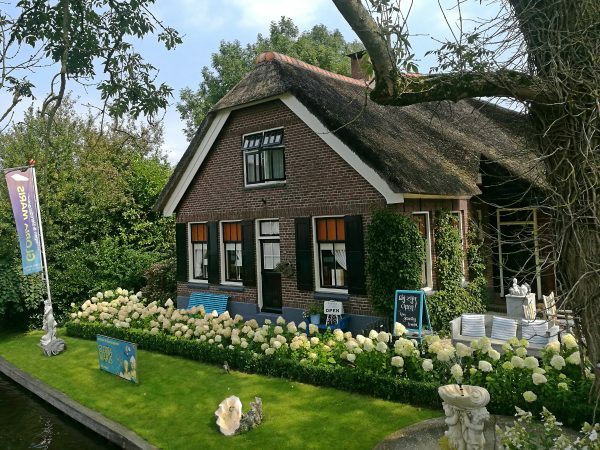 But if you go to Giethoorn from Amsterdam make sure you also stop in at De Orchideen Hoeve!! Then again, Giethoorn and De Orchideeen Hoeve are hard to get to unless you’ll have a car. If you don’t have a car I would suggest going by train to the Hague or Utrecht for a daytrip. Hope this helps a bit! Beautiful, picture-perfect little town. Wonder what it would be like to actually live there? Enjoyed very much your photos and comments. I think it would be lovely to live here during the off-season, but probably annoying to be a resident during the tourist season! Glad you enjoyed it Gran! Really good to know info! We’re visiting in June 2019 with our 3 year old daughter …any thoughts/ suggestions? 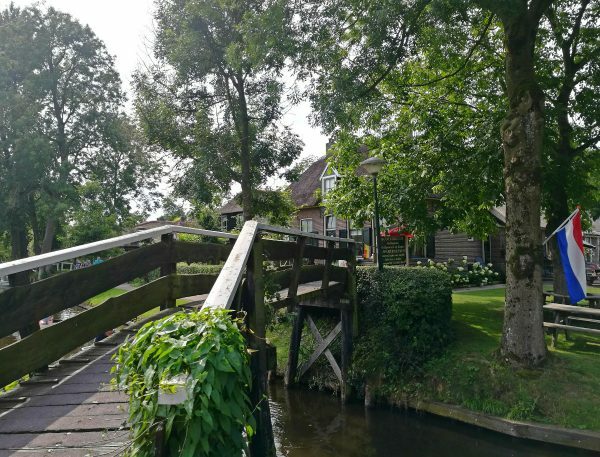 Since writing this post I have learned that even in the busy months Giethoorn is lovely if you stay overnight! That way you can enjoy the quiet in the morning and evening before/after the crowds arrive/leave. If you are travelling with a little one this might also be a good way to break up the travel time, especially if you’re using public transport. Hope you have a lovely trip!